Japanese Episode AG 071: "Ookido-Hakase to Odamaki-Hakase! Himitsu Kichi no Tatakai!" American Episode 343: "A Six Pack Attack!" 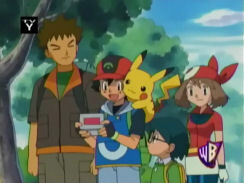 Now that Satoshi has his fifth badge, he's eager to travel to the location of the next Gym Leader. However, before he can do that, the gang has to meet up with Odamaki-Hakase to check in on him. It turns out that the professor is going to meet with Orchid-Hakase, so Satoshi and Takeshi go with him to go meet him at the harbor. Orchid-Hakase soon arrives on his own, and he shows a delighted Masato and Haruka the three starter pokemon from the Kanto region. The show is cut short when the Rocket-Dan, in a giant Popocco mecha, steal all the starter pokemon! Orchid-Hakase and Senri's children chase the trio to their Secret Base, located in a cave behind a waterfall. 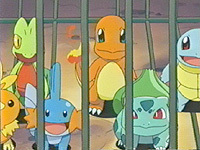 There, they encounter the kidnapped pokemon, and soon they succeed in retrieving the stolen pokemon. As they try to leave, the Rocket-Dan activate a giant steel door, but with the teamwork of everyone's pokemon, the door is knocked down. After the Rocket-Dan are sent blasting off again, Satoshi and his friends reunite to get on a ferry to Hiwamaki City. There's always a filler episode after a Gym Battle episode, but this one is actually fairly decent. Masato finally gets to meet one of his mentors, the anime gets a little Fire Red / Leaf Green promotion with the inclusion of the Kanto starters, and we get to see a little foreshadowing with Haruka and Fushigidane. In addition, hearing both Masato and Orchid-Hakase command pokemon is a rare treat, so that made this episode that much more enjoyable. The dub has the second alcohol cover-up this season in this episode, but other than this this one's pretty standard as far as the dub goes. Pochiena keeps its Japanese voice. A second is cut from the first shot of the episode. Satoshi's horribly offensive badge case is digitally painted. A second is cut from the pan shot right after the title screen. Also, another second is whittled away from the scene where Odamaki-Hakase says hello to the Airmd (or however the hell you romanize Skarmory's Japanese name). Professor Oak: "You can't just hide a gigantic balloon that's shaped like a Skiploom all that easily." That was a robot / mecha that took all those pokemon, not a balloon. In the Japanese version, Orchid-Hakase's voice sounds really off in a few scenes. Orchid-Hakase is voiced by the same person in this episode as he is in all the other episodes (Ishizuka Unshou), but there are a few scenes in this episode where he sounds like he has a cold or something. I know this sort of thing happens with the dub quite frequently, but I wanted to point out that it also happens in the Japanese version as well. So the big Rocket-Dan drinking scene couldn't have aired on a kids' network without some edit, right? Surprisingly, there was only one paint edit made--4Kids changes the shape of the Rocket-Dan's champagne glasses to more cup-like glasses. Because they got rid of the long neck, they also had to redraw Nyasu's hand in the first shot of the glass. You can see images of the scene here. The odd thing is, I've heard reports from people in the UK stating that they didn't get the champagne glass edit, meaning that this could be yet another edit fo place under the "Kids' WB!-only" column. Everything else about the scene was kept the same. They could have painted away the blush on the Rocket-Dan's faces or gotten rid of some of the squiggly lines or redrawn their eyes to cover up their drunken state, but they didn't do any of that. In fact, they even made the scene even MORE obvious by having Meowth say "I'll drink ta dat!" Amazing. And in case you're wondering, yes, that really is water the trio is drinking. It's the same liquid in the Japanese version as it is in the dub. How they're getting drunk off it is anyone's guess. The scene of the starter pokemon tickling Max right before the Trainer's Choice commercial break was two seconds longer in the Japanese version. Then, right after the commercial break, about a half a second is trimmed from the panning shot of the canyon. When Orchid-Hakase and the others are trying to burst down the door to the Rocket-Dan's Secret Base, Ready Go! (the fifth opening theme to the original Pocket Monsters series) is playing in the Japanese verison. Naturally, it's replaced in the dub. A second is cut right after the final commercial break.